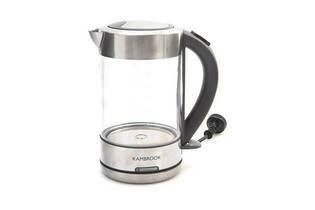 Snapshot: The 1.5L Kambrook KKE760CLR has a push-button lid-opening, but no audible "water boiling" reminder. How noisy is it? Kettle is glass so will need regular cleaning (any brown limescale residue can be seen at the bottom of the jug).